This curry is delicious, flavorful, and oh-so-satisfying. And, believe it or not, it's ALL vegetable based! Transfer the onions, garlic and sweet potato chunks into a blender, and add the rest of the ingredients. Blend well, scraping down the sides, until everything is creamy. Adjust seasonings to taste and set aside-- this is your curry sauce. The best part of curry dishes, if you ask me, is eating it the sauce with rice, so even if you're not eating grains, you can still enjoy this curry sauce over a bed of cauliflower "rice!" (Simply pulse raw cauliflower in a food processor, until you have a rice-like texture.) 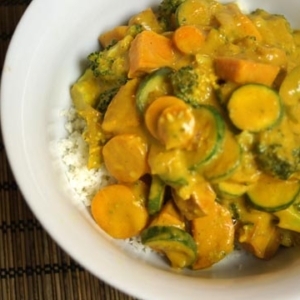 Pour the curried vegetables over the rice and serve warm.